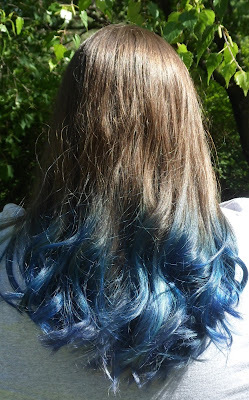 For at least 15 years, I've wanted to dye my hair an unusual color. So this summer, I finally did. For now, with so much on my plate with edits and deadlines and The Next Book that needs researching and writing, I think I'm leaning toward a nice, simple trim. *in retrospect, perhaps dyeing my hair blue at the height of summer was probably the most inconvenient element of the pool-water/swimming concern. Live and learn! My niece has purple hair right now and I love it! Wish I were as brave as you two. The nice thing is that you can color it again another day! Yes! And I did just the ombre kind of tips because I was really nervous about bleaching my hair -- and I figured this way if I didn't like it I could just cut it off and have done! I'm glad I didn't bleach my whole head, though -- I'm not sure I like how my hair feels where it was bleached, and it tangles a lot more. so! Live and Learn! SALE: Honor Among Orcs for just 99cents!